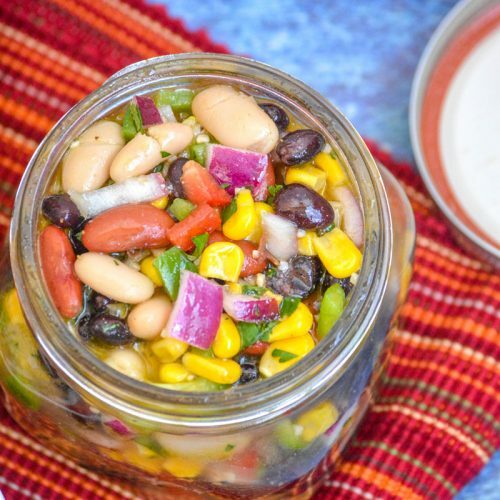 A lovely Summer dish, this Mexican Three Bean Salad is bright, colorful, and a refreshing dish- best serve cold. Bound to be the hit at any pot luck or barbecue, this stellar side dish also make a light, but filling meatless main meal when the weather gets warm. While there’s all kinds of different things that are considered food-centric for the different season, fresh seems to always be a constant theme for Summer. Whether it’s fresh berries, or fresh veggies from local farms, ‘fresh’ is definitely something we embrace in our own kitchen in the warmer weather. In a perfect world, fresh flavor would also mean 100 % fresh ingredients, I’m a working Mama- and those cards aren’t always on my table. Luckily, I’ve found certain dishes over the years that give us that same ‘bursting with bright flavors’ I’m craving, and also easy to throw together. Bonus points if the dish also is easy on both my budgets, my free-time and my wallet. 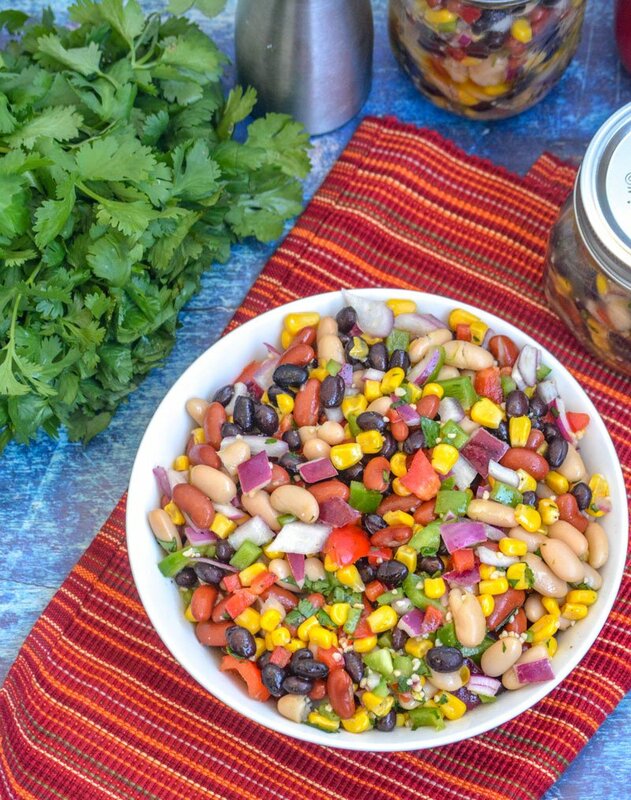 This quick & easy Mexican Three Bean Salad checks all the boxes, including the unmentioned one that means my whole crew needs to absolutely love it. Boy, do they every! It’s even become my go-to for any barbecues, pot lucks, or parties we’ve been invited to this season where a covered dish is expected. Gone are the days where I’ve got to worry about someone else bringing potato or pasta salad, even if it’s a different version. For us, it’s almost always considered a side dish, and it always pairs well with whatever grilled meat is on the host’s menu. However, it’s packed full or protein and would make a complete vegetarian lunch or snack. Three different kinds of canned beans give this dish it’s rich, protein packed focus: black beans, kidney beans, and cannelloni beans. 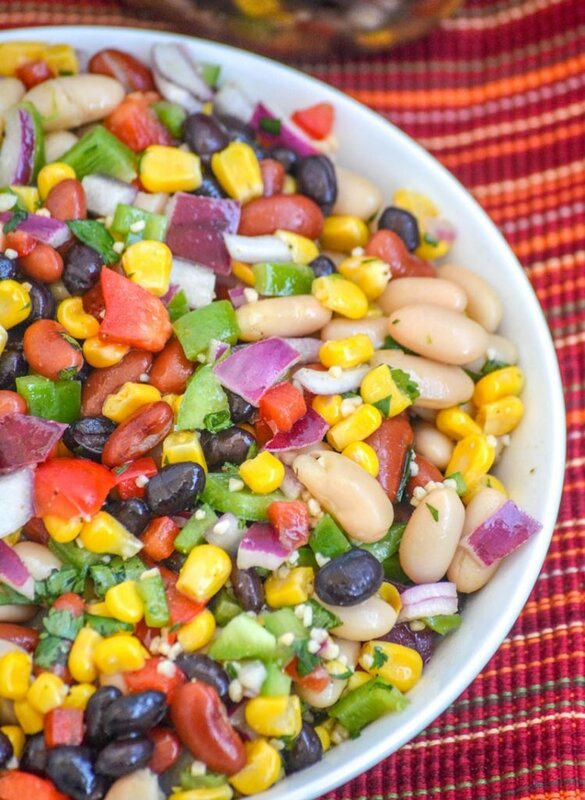 Added to that are fresh, in season chopped green & red pepper, sweet corn kernels, and red onion. All the veggies are tossed together in a big ol’ mixing bowl before being stirred with a zesty, tangy, lightly spiced cilantro lemon vinaigrette. Sounds fancy, tastes amazing, but is shockingly simple to whip up. From start to finish, this dish doesn’t hold any surprises. It’s straightforward enough for any cook, and always deliver results. It’s guaranteed to ‘wow’ any crowd, at home or at the next neighborhood cook out. It’s also great for meal prep. Make a batch on the weekend, store it in tupperware in the fridge and enjoy all week long. 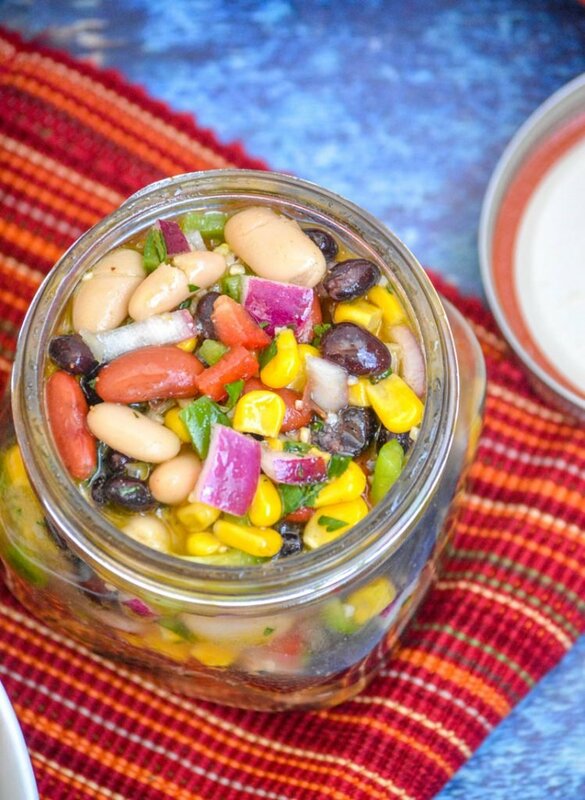 Or do like the Hubs does, and seal it in single serve mason jars and take it for a hearty, but light lunch in the heat. 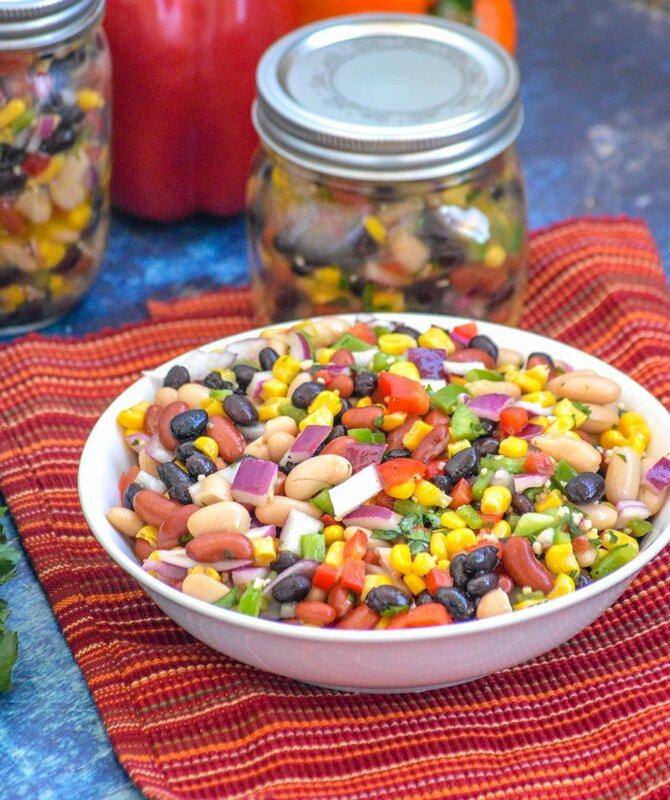 Other yummy bean recipes you might also enjoy: Nanny’s Four Bean Salad, Garlic Ginger Green Beans, & Crispy Oven Baked Green Bean Fries. 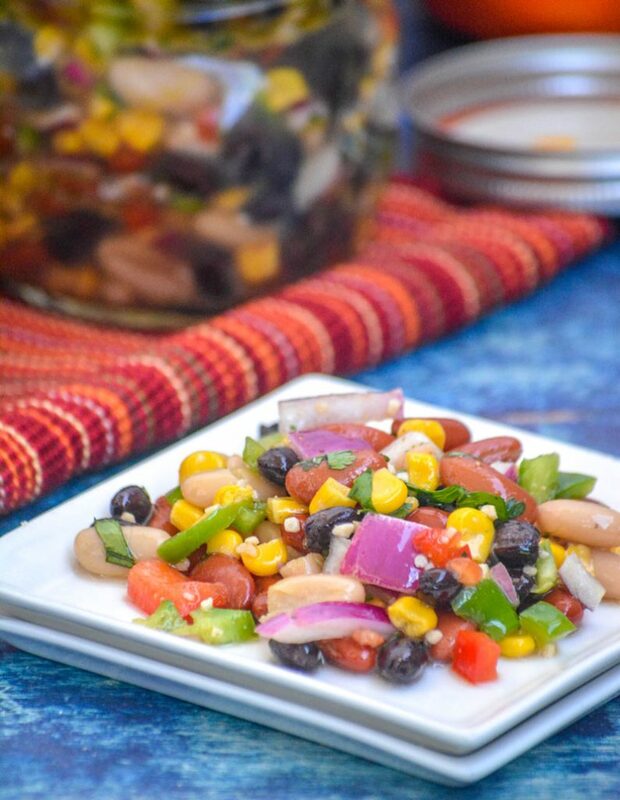 An easy veggie ladden bean salad, this one is tossed in a zesty, Summery vinaigrette making it a perfect supper side dish to any grilled meat, or a protein packed meatless meal or snack. Add the beans, peppers, corn, and onion to a mixing bowl. Gently toss to evenly combine. In a smaller bowl, add the remaining ingredients. Use a wire whisk to whip together until evenly combined. Pour the mixture over the veggies. Stir gently to completely coat. Cover the bowl to seal. Refrigerate for an hour, or until chilled. Serve & enjoy! This is such a pretty, colourful salad. It’s healthy too, to boot! 🙂 Lovely recipe! Hi there, great summer recipe! Just a quick mention that you forgot to add the Fiesta Friday comment. I can’t nominate you for the recipe of the week unless you do that. Read the directions on the FF website. Great post.